Fr. Tom Papazoglakis serves as Rector of St. George’s Church along with his wife, Mtr. Elizabeth Papazoglakis who is the Associate Rector. Fr. Tom graduated from Louisiana State University with Bachelor of Architecture in 1978, receiving his architectural license and NCARB certification in 1981. He holds a Master of Business Administration (MBA) from Tulane University. Fr. Tom left his career in the design and construction industry to attend seminary at Nashotah House Seminary in Nashotah, WI. He received a Master of Divinity in 2002 and was ordained to the diaconate in 2001. He was ordained priest in 2002. He served as Associate Priest at St. Bartholomew Episcopal Church in Pewaukee, WI, before being called as Priest-in-Charge in 2003. He left this position in 2012, spending two months in Cairo, Egypt while on sabbatical and as a guest of the Episcopal Diocese of Egypt. Fr. 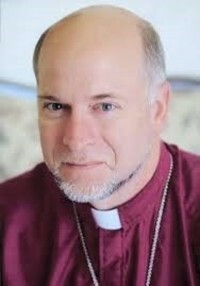 Tom was called as Rector of St. Mark’s Episcopal Church in 2013 where he served until being called with Mtr. Elizabeth as Priests-in-Charge of St. George’s in November 2015. Fr. Tom was called as Rector of St. George's in March 2017. Fr. Tom is a Doctor of Ministry student at Nashotah House Seminary and anticipates graduation in 2018. Fr. Tom and Mtr. Elizabeth have been married 39 years and have three grown daughters, Erika, Niki, and Sarah (Boris). They have three grandchildren, Ainslie, Aidan, and Ashton. Mother Elizabeth Papazoglakis serves as Associate Rector of St. George’s Church with her husband, Fr. Tom Papazoglakis who is the Rector of St. George's. She graduated from Louisiana tate University in 1977 with a Bachelor of Science degree and holds a Master of Arts degree from Nicholls State University in Psychological Counseling. Mtr. Elizabeth worked as a Psychological Associate for a residential facility and had a private counseling practice, specializing in issues of marriage and family, prior to entering seminary. She received her Master of Arts in Theology from Sacred Heart Seminary and School of Theology in Hales Corner, WI. She was ordained Deacon in 2009 and Priest in 2010 in the Episcopal Diocese of Milwaukee. 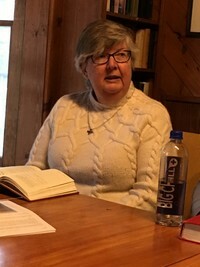 She served as Curate and then Associate to the Rector at Trinity Episcopal Church in Wauwatosa, Wisconsin, from 2010 to 2013. Mtr. Elizabeth is a Doctor of Ministry student at Nashotah House Seminary and anticipates graduation in 2018. In 2013, Mtr. Elizabeth was called as Rector of St. John’s Episcopal Church in Massena, NY. Mtr. Elizabeth and Fr. Tom Papazoglakis accepted a call to St. George’s to serve as Priests-in-Charge beginning All Saints Day, November 1, 2015. She was appointed Associate Rector in March 2017. Mtr. Elizabeth and Fr. Tom have been married 39 years and have three grown daughters, Erika, Niki, and Sarah (Boris). They have three grandchildren, Ainslie, Aidan, and Ashton. Skye officially began this position with St. George’s in July 2017. She has been responding to her deep calling to music ministry for some time. She’s a soprano with roots in United Methodist hymns, and wings in evangelical worship songs. Previously she served on worship and leadership teams at Grace Chapel of Clifton Park while at the same time following her heart to a more liturgical worship experience. She is thrilled at God’s provision of the opportunity to express our faith through the rich tradition of common prayer buoyed by fresh musical offerings. Skye is mom to two energetic boys, Gavin and Tynan, heads up communications for Glens Falls City School District, and can also be found running, swimming, or enjoying the St. Lawrence River (be sure to wear your lifejacket—she’s a certified boating safety instructor! ).